Quadrupole mass spectrometers offer fast, on-line atmospheric pressure gas analysis with the ability to monitor a large number of different gases and gas mixtures with a single analyzer. 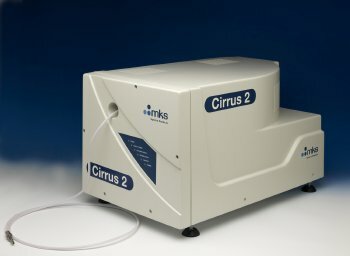 The MKS Cirrus 2 Atmospheric Pressure Gas Monitoring System offers the versatility of Microvision 2 quadrupole mass spectrometry in a convenient bench-top configuration. It is ideal for on-line monitoring and analysis of gases and gas mixtures including trace contaminants in process gases, solvent vapors, hydrocarbons, atmospheric and inorganic gas species (including corrosives), freons, and noble gases. Gas compositions can be tracked over a wide dynamic range (ppb to percentage levels) with a speed of up to 250 data points per second. The heated silica capillary inlet ensures a rapid response to changes in gas composition. Micromeritics' AutoChem II 2920 Chemisorption Analyzer is a fully automated instrument capable of conducting a comprehensive array of highly precise chemical adsorption and temperature-programmed reaction studies. The instrument gives the researcher the ability to obtain valuable information about the physical properties of catalysts, catalyst support, and a variety of other materials. Micromeritics' AutoChem 2950 HP Chemisorption Analyzer is an automated high-pressure catalyst characterization system that is capable of preparing and analyzing samples at elevated pressures up to 1000 psia and at temperatures from -100 to 1100° C .
The Cirrus 2 system enables the AutoChem II and AutoChem 2950 HP to function as multi-component microreactors. Cirrus 2 software includes Process Eye Professional which controls analyzer data collection and monitors real-time data and analyzer status. A Recipe wizard helps create and configure analysis conditions. The Micromeritics/Cirrus interface software runs inside Process Eye Professional and is accessed via its own menu. This interface enables the user to control the analyzer via recipes which can also be saved for future use. Micromeritics has included preset parameters in the software, enabling you to create Peak Jump recipes with just a few keystrokes. The interface allows the user to collect data automatically from the AutoChem, customize Peak Jump recipes, access standard operations, calibrate detectors, and scale the AutoChem sample thermocouple signal.